I walked along the main track, smiling all the while. Bunnahabhain is not a gleaming, freshly painted glamour queen like some other places, and I could care less. My favorite whisky comes from here, and I was going to see where the magic happened. Besides, if you’ve read some of my earlier posts, I have an appreciation for the grungier side of life. Bunnahabhain visitor’s center. Yes, that is me, I don’t like to advertise myself but this was the best shot we had of the place. The scene brightened up at the visitor’s center, a re-used storeroom with a freshly scrubbed and painted exterior. Inside is a small shop with the usual swag and special bottlings. They have a variety of expressions from past Islay Whisky Festivals in white canisters. After a short discussion of Bunna’s history and future, we repaired through a portal to a courtyard across the way. 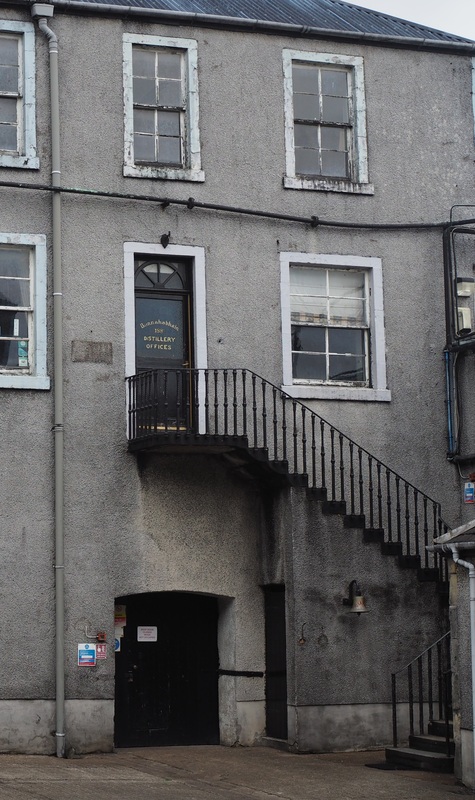 Scott pointed out an iron-railed staircase that led to the Bunnahabhain offices. I looked wistfully, wishing for an opportunity to take a peek inside the brain center of Bunna. Unlikely, but dreams do come true…. 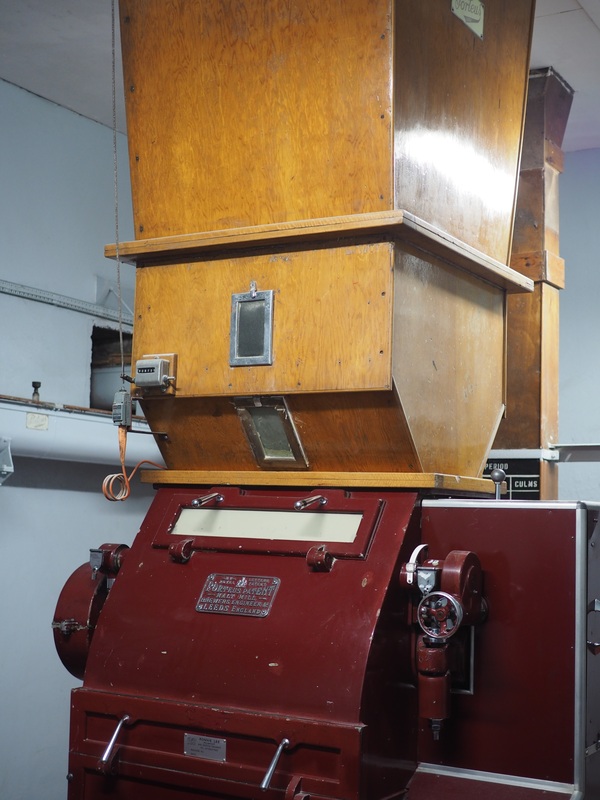 Next we went inside where Scott showed off their 1964 Proteus malt grinder, a deep red beauty with a bespoke wooden hopper; we then filed past a control panel and up the stairs to a worn-out calculator, held together with tape and hope, and beam balance by which they analyzed each new batch of malted barley. The balance and measuring tools are used to determine the density of the grind. The wooden brewer’s box is where it starts. A sample from the mill is added and the box is then shaken 80 times. By then, the screens inside will have filtered the grist into husk, grit and flour. They fine-tun the mill based on the density — too much flour and the mash is too dense, too much husk and the mash is too watery. It’s a mash tun, son. Next we visited the mash tun, showed at right. The tun was empty, so I got a nice shot of the interior. Clean machine. This is their ‘new’ 1960’s era tun, the old one being at Bruichladdich. It’s a bit smaller than the tun at Glenfarclas, for comparison. On the wall Scott pointed out the level sticks that have served the distillery since it was built in 1881. They have a computer to track tank levels now but Scott said the crew still use the easy-to-read wall mounted levels. Pretty cool. I hope when they update the place they preserve these Edwardian era indicators. 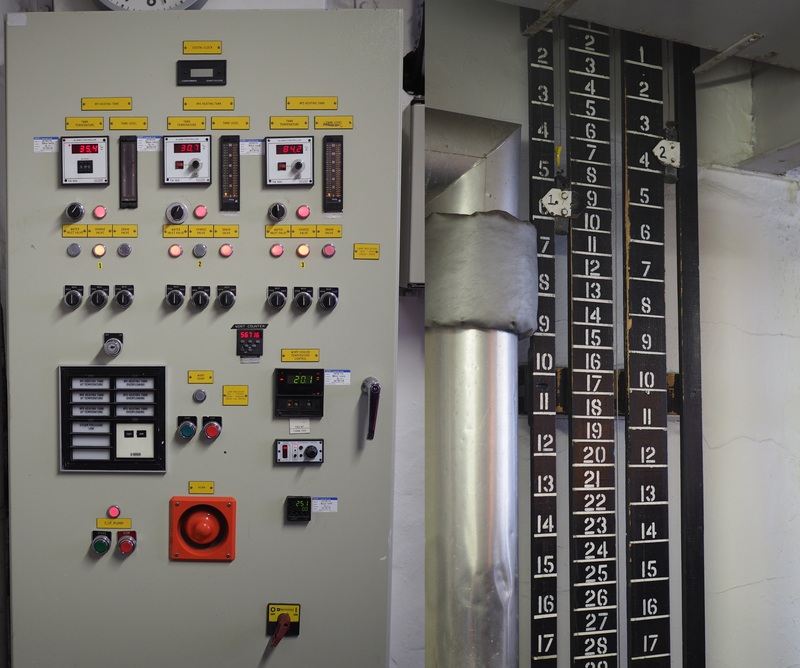 Tank controls, old (right) and new. Click for hi res. 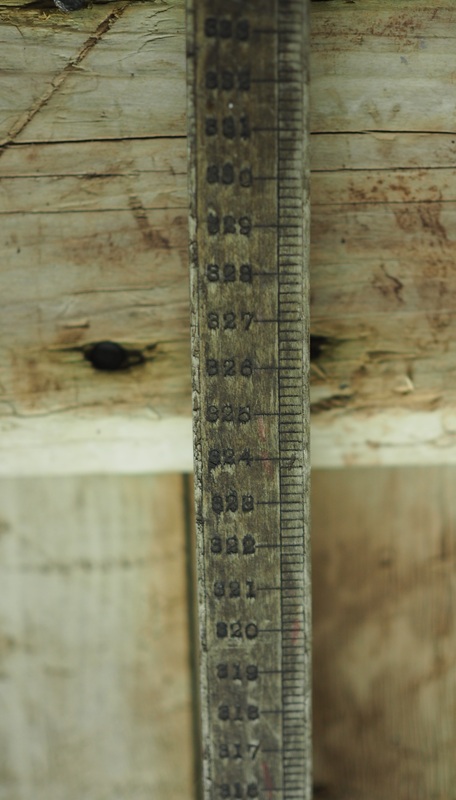 A measure stick in the washback room. Every scratch and dent tells a story. That’s a lot of stories. The washbacks were next. Each of the five washbacks is six meters tall and made of Oregon pine; they’ve got a lived-in look, these venerable old soldiers. My notes say they are 100 k liters – they fill with 66.5 k liters wort and 5k L cold water with 250 kg yeast. It takes seven hours to fill. Then follows a 48 hour ferment, but the wash can be in the washback as long as 80 hours. In the next room are the stills, two wash and two spirit. It’s a crowded still room, and for the first time we see stills with no ornamentation, no polishing, just the copper aging in its own way. Here the fermented wort is heated to 92 degrees (Celsius I assume) and these very tall stills have three windows to monitor the height of the foaming wash. In the spirit stills, the low wines will be about 28% alcohol. During the second distillation, the head, consisting of 90% down to 74% alcohols and esters, distills out within 15 minutes. The heart, the good stuff, takes about 2.5 hours to reach 65% alcohol, and the tail is run down to one percent. These are split out in the spirit safe. Below is a photo of the Bunna spirit safe. Just to think, every bottle of Bunna you’ve tasted cascaded through here. If I were a billionaire I’d have a duplicate made just to have in my man cave. Sigh. Our next trip was to the warehouse and here, unlike everywhere else, we were free to wander around, take photos, run our hands over the casks…no stress, no bogus ‘flash danger’ from our cell phones. Unhurried, each visitor spent his or her own time contemplating the spirits at rest here. 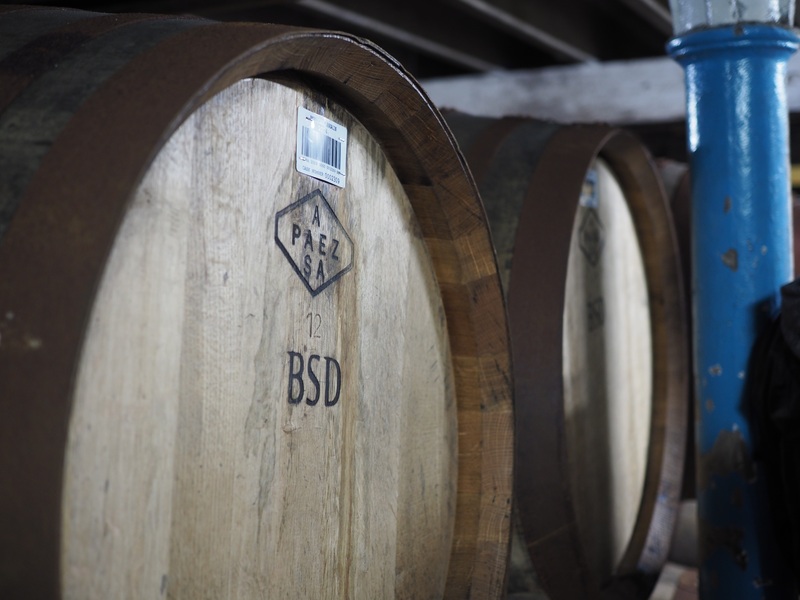 The magic happens in these casks. If that was not enough for me to appreciate Bunnahabhain’s hospitality, the best was yet to come. Scott led us back to the shop and through to the back, in a converted storeroom where a dark oak table held a herd of Glencairn glasses. We all stuffed in, about 8 of us, for a convivial chat about Islay history (Scott is the editor of the local paper) and a little celebrating as this was my wife’s 50th birthday. Everyone was joyful and friendly, and then we got to tasting. As we had arranged an extended tasting, my wife and I got to start with a couple special malts and damn were they good. Good thing we had a ride to the next venue. We tried their very tasty 18-year, the slightly peated Toiteach, then a much peatier expression, the Cruach Mhona, a cask-strength monster with 25 ppm peat – ‘slightly oily’ I noted. The rest of the tasting covered three special release expressions — Bunnahabhain certainly rolls out the red carpet for their extended tasting. We all had a good chat, whisked our whiskies around the Glencairns, and repaired unhurriedly to the shop. Brimming with enthusiasm, I gazed at the wall of special releases until I found bottle number 600 from the 2017 festival. Along with the self-bottled mini-bottle from the Balvenie, this is my top prize from that trip. Every now and then I pull it out for a tiny taste and go, wow! And yet, we’re not done…I had to use the bathroom, so I was directed…UP THE STAIRS IN THE COURTYARD!!! 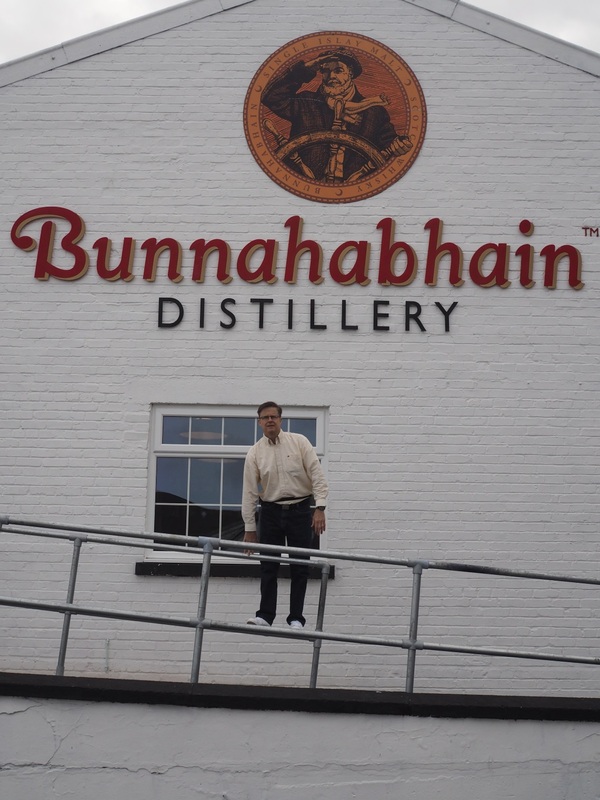 Yes, I got to infiltrate the inner sanctum of the Bunnahabhain distillery. 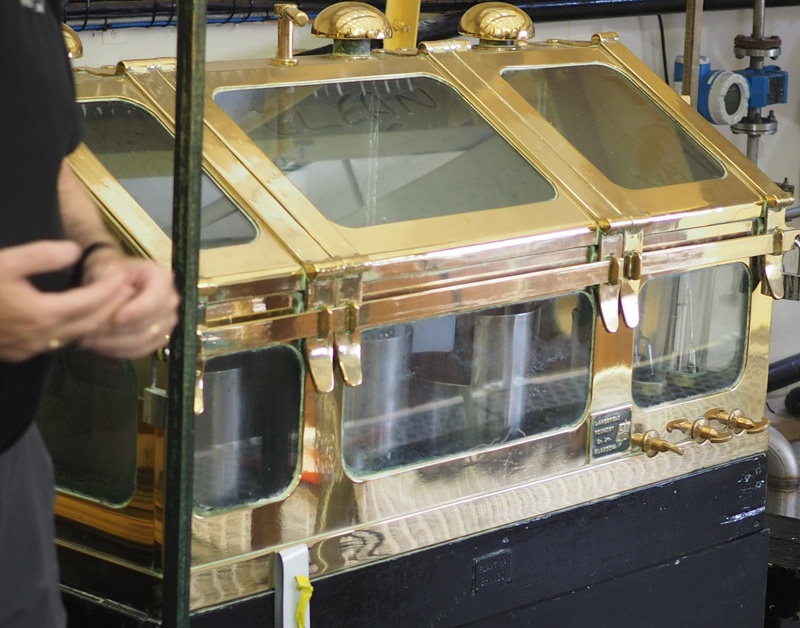 Past the door of the general manager and the malt-master, past a really gorgeous old safe (what lay within? Recipes?). Nice bathroom, too, wainscotting, vintage plumbing in top condition. As the wife and I ate our lunch our by the loch we laughed at how wonderful we had found the whole experience. 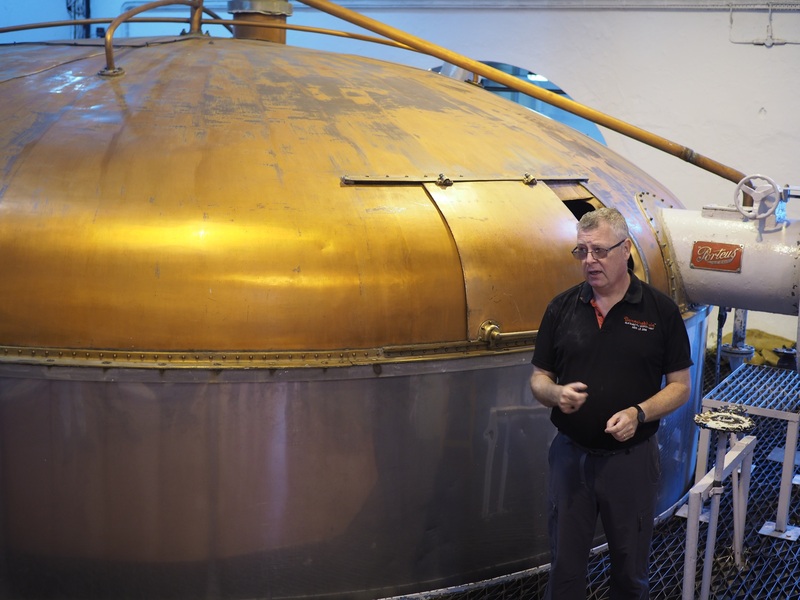 The antithesis of the marketing-driven multimedia-led zip tour of Glenmorangie, Bunnahabhain’s tour was a throwback to a simpler time and an honest display of workmanlike approach to making a very good whisky. Sure, I hope Distell puts some bucks into the plant, and for sure they could use a more capacious visitor’s center. But I hope they read this review and realize the goodwill an open, honest presentation to the product can bring, that allowing the faithful to wander among the casks is worth more than a thousand brilliant marketing ‘hooks.’ We who appreciate craft come to see the craft, frozen as it is in time, the secrets obscured behind the wood and metal of the still and washback, like the meaning that lies behind the words of a poem. This entry was posted in Distillery Tour, Whisky and tagged bunnahabhain, Scotch, single malt, Whisky. Bookmark the permalink.